Beth Mitchneck presented “Institutional Change for Equality: A Recipe for Change” as part of Chancellor's Dialogue on Diversity and Interdisciplinarity. 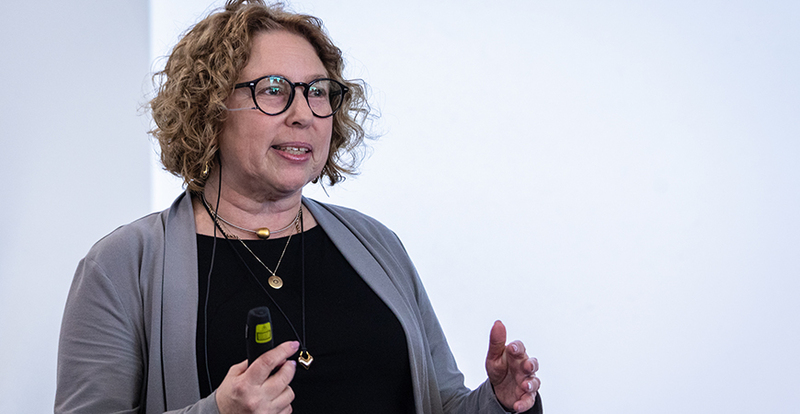 UC Merced welcomed Beth Mitchneck, vice provost for Faculty Success at University of Massachusetts, Lowell, as part of Chancellor’s Dialogue on Diversity and Interdisciplinarity series last week. Mitchneck presented “Institutional Change for Equality: A Recipe for Change,” which provided a framework for institutional transformation to help universities become more gender equitable. “This is not something we can accomplish overnight,” Mitchneck said to an audience of faculty, staff and students at UC Merced. “This is something that involves everyone in this room and everyone outside of this room. Mitchneck introduced a six-step “recipe” to help universities devise a plan to encourage gender equitability. Tips such as ensuring a social scientist is on a change committee and focusing on promoting change at the department level were part of the process Mitchneck outlined. 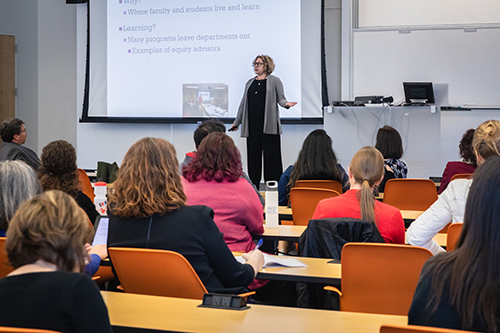 Faculty, staff and students listened as Mitchneck discussed the six-step recipe to help universities devise a plan to encourage gender equitability. The framework is the focus of a journal Mitchneck co-authored entitled “Recipe for Change: Creating a More Inclusive Academy, ” which reviews the literature on institutional change to promote faculty diversity. They propose essential features necessary for successful change and a more diverse workforce. Mitchneck has a dual research focus on gender equity in science, technology, engineering and math (STEM), as well as migration and displaced populations with an emphasis on countries of former Georgia and Ukraine. Mitchneck, also a former lead program officer for the National Science Foundation’s ADVANCE program, drew upon her own experience managing gender equity programs to highlight the importance of shared networks for achieving equity goals.